So there really is no recipe for this. I scrambled 4 eggs with a splash of milk, salt and pepper and a dash of sri racha sauce. The sauce doesn't make the eggs spicy, it just adds a little something that cuts the richness of the egg and cheese. I melted a little butter over medium low heat. To me, the secret of stellar scrambled eggs is using lower heat. Low and slow works for barbecue and scrambled eggs! After the eggs began to set, I added a few teaspoons of chive cream cheese. I added it early because I wanted it to completely melt into the eggs. Devin loves cheese cake, but he would not like chunks of cream cheese in his eggs. If he never sees it, he won't know it's in there! The cream cheese makes the eggs richer and adds a little extra flavor. 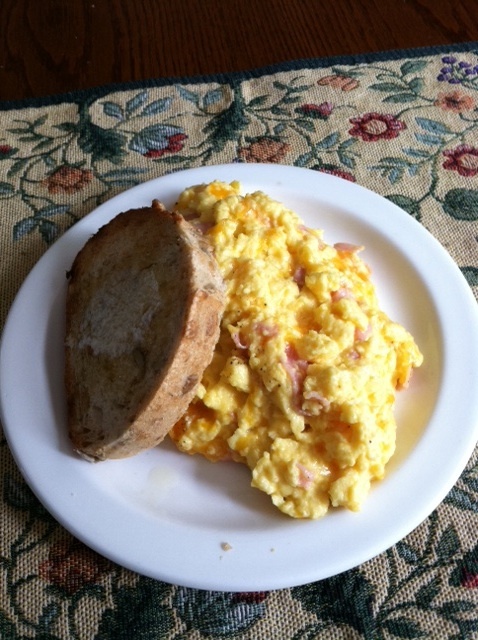 When the eggs were just about done, I added the chopped ham and shredded sharp cheddar. I took the eggs off the heat and continued folding in the ham and cheese until the cheese was melted. The eggs were served immediately with a slice of sunflower seed bread. Very creamy and comforting on a special Sunday morning.